Rep. Maxine Waters, D-Calif., greets the audience during the swearing-in ceremony of Congressional Black Caucus members of the 116th Congress at The Warner Theatre in Washington, Thursday, Jan. 3, 2019. For years it was just the Congressional Black Caucus, or the CBC. In the 1980s they were nicknamed the Conscience of the Congress. Several years ago contributor to The Root, Lauren Victoria Burke, launched a blog calling them Crew of 42. Of course that name didn’t fit for long as the largest collection of black political figures in America continued to grow with every subsequent election. Now, the CBC is swole, with 55 total members, including: two senators, 9 freshmen, the Majority Whip James Clyburn (D-SC) and five House committee chairs. Are they the Divine 55? The 55th Lower Chamber? When it’s time to block Trump policies do we chant “I got fifty-FIVE on it?” No matter what they’re called the new Congressional Black Caucus is the tip of the spear in the resistance to Trump and he is not ready. I spent Thursday morning at the swearing in of the new Congressional Black Caucus at the historic Warner Theater in Washington, D.C. If you’ve never been to a CBC swearing in before (I hadn’t) it’s quite a sight to see. Black politicos of every stripe line the halls and crowd into the room dressed in something between “Sunday best” and “Friday night, after work, I’m-heading-to-Happy-Hour” style. However unlike Congressional Black Caucus weekend, which is a party for the politically initiated, the swearing in felt like a mixture between the first day of school and an HBCU graduation. The first day of school vibe comes from the fact that this CBC is full of first-time politicians. Ilhan Omar (D-MN) only served two years in the Minnesota House of Representatives before winning a Congressional seat. Jahana Hayes (D-CT) was a teacher-of-the-year but never held any kind of public office before running. Collin Allred (D-TX) was an attorney and former NFL player before running last year. Lucy McBath (D-GA) was one of the “Mothers of the Movement” prior to knocking out Karen Handel for about 5 percent of what Democrats spent trying to win that seat in a 2017 special election. In other words, simply getting to Congress and finding your way around is a crowning achievement for most of these members, but getting sworn in? Now that’s the graduation. If you’ve ever been to an HBCU graduation (or heard the reactions of the few scattered black parents when that first generation kid walks across the stage at a predominately white institution) you know how loud and celebratory black folks can get. The CBC swearing in was no different. The cheers when the entire panoply of political talent came across the stage were amazing. Specifically whenever Jahana Hayes name was mentioned a group in the back left of the theater went crazy like she’d just shouted out Waterbury, Conn. in a call-and-response lyric. 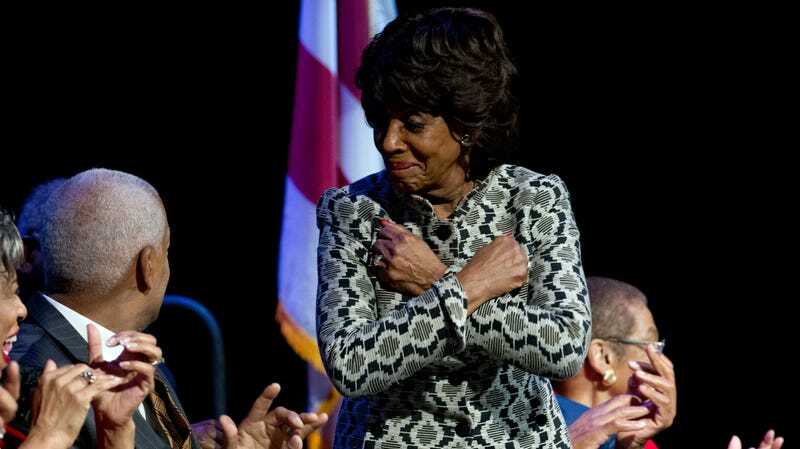 Maxine Waters came on stage and gave the “Wakanda Forever” salute to her colleagues and the audience roared so loud you’d have thought there was vibranium in the rafters. Clearly picking up on the vibe, Speaker Nancy Pelosi (D-CA) came in and spoke about the great work that the Congressional Black Caucus has done under the leadership of Cedric Richmond and how the CBC was officially the “nuck” for her Congressional “buck” when it came to dealing with Trump. “And he [Cedric Richmond] continues to be an intellectual resource to us as we fight some of the fights...Well...engage in some of the challenges as we go ahead,” said Speaker Pelosi to laughter from the crowd. Pelosi also gave a shout out to the many important committee chairmanships that are now headed by members of the Caucus. The newly minted speaker then went on to discuss how the top of the new Congressional agenda would be the restoration of the Voting Rights Act as well as legislation giving voting rights to the District of Columbia. “We’ll be doing all of this under the leadership of our Big Daddy Mr. Clyburn,”said Pelosi, which garnered more applause throughout the room and a couple of odd laughs as we wondered how Clyburn got the nickname “Big Daddy” and whether Pelosi was being a little too lose with an inside joke. Once Pelosi left the stage to meet with other incoming members new CBC Chair Karen Bass (D-CA) kept the party going by throwing down the gauntlet for the new Caucus. She all but called President Trump a white nationalist and made it clear the CBC would stand in the face of any of his horrendous policies, not just as a moral center but as a huge voting block that must be reckoned with. “America is becoming more diverse and that diversity is leading to the browning of our nation,” Chairperson Bass said. Will the Congressional Black Caucus, now 55 strong, be able to bend Congress to the will and concerns of black voters? With 55 members they literally make up almost a quarter of the Democrats in the House. Numerically this is likely the most powerful the CBC has ever been. Assuming Karen Bass can keep her caucus together, and put forth an agenda that addresses the needs of African Americans as well as the concerns of her fellow caucus-mates this blue wave will likely be driven by a black undercurrent.